We have sign up forms for specific volunteer opportunities. We would also love to hear about your gifts and how you can share them with our community. We appreciate you and respect your privacy. As a courtesy, you will receive an email reminder 3 days before the event. We understand that schedules may change. Please contact the Event Chair directly with any changes. We appreciate your time. • Altar Servers are the youth of our parish who assist the celebrant in a liturgical service. They may start after their First Communion and continue for as long as they desire. Altar servers serve once a month, or as often as they want. Periodic training sessions are conducted for new recruits as required and detailed instruction sheets are provided to remind them of their duties. • Lectors The Bible’s is God’s Word, and Jesus is the Word made flesh. The Lector, through study, preparation and practice of oratorical skills, give flesh to the Word in the First and Second Readings, strengthening Christ’s presence in the Liturgy. *Important: A background check is required for all NEW volunteers who will be around unsupervised youth on an ongoing basis (i.e catechists, aides, chaperone drivers). Parents who help out occasionally during gatherings where they have a child in that class (i.e serving food before class, classroom chaperone) while in the presence of other adults do not have to be certified. 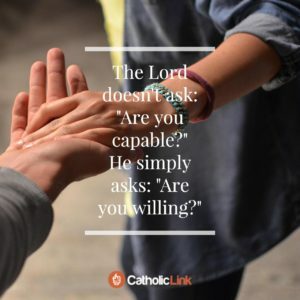 For new cathecists/chaperones: Please visit https://cmgconnect.org . Choose “San Diego” from the Diocese dropdown list. We appreciate your full cooperation in promoting a Safe Environment for our children. Please share this wonderful opportunity with your family and friends.